Although this work week was shortened by the Memorial Day holiday, there were plenty of stories in the world of technology, law, and the workplace. Maybe it's because I just (finally) saw The Social Network, but the news about San Francisco start-up Hipster's unique search for employees stood out to me. 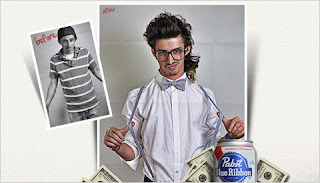 Hipster, looking for engineers, has taken to the web with a hilarious (though somewhat concerning) pitch: they are offering $10,000, a year's supply of Pabst Blue Ribbon beer, and an assortment of hilarious "hipster" accessories, such as a fixed gear bicycle, skinny jeans, and even "'stache grooming services." I have to admit that this is a very clever marketing move by Hipster. According to the New York Times, Hipster attracted a host of qualified candidates with little to no marketing costs. However, I've written earlier on the blog about the EEOC's stance on the disparate impact of required technology in the hiring process. If, as it appears, the advertising for this position is online only, Hipster could find itself in hot water with the EEOC. But Hipster could face liability for a lot more than just disparate impact claims. Mustache grooming services? Are they trying to get sued for gender discrimination? And a year's supply of beer? I hope they are ready for the havoc that could unleash in the workplace! I'm not just thinking about bad behavior fueled by alcohol. What if employees develop substance abuse problems as a result of this workplace "perk"? Who is liable for an employee's off-duty misconduct or accidents caused by on-duty drinking? It doesn't take an employment lawyer to dream up the nightmare scenarios for an employer that offers unlimited alcohol to employees during working time! In the end, Hipster may find that its marketing campaign was worth the risk. I just hope that Hipster went into this 'viral' campaign with its eyes wide open on the employment law risks it could face. Below are some of the other articles and blog posts that I've read in the last week. Although not as exciting as hipsters and free beer, I think they're still pretty interesting!